Custom bikes can be eye-catching, but designing one usually requires sourcing components from a staggering array of producers, none of whom will actually help you with your cobra infestation. What good are you, Mongoose? 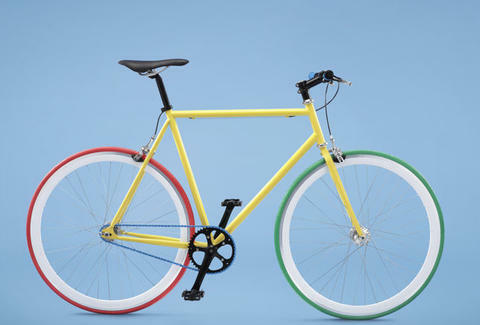 For a much simpler (and cheaper) way to get a bike that's all you, check out Bike By Me. From a cadre of savvy Swedes with a bike scene jones and no patience for off-the-rack shopping, BBM's fresh take on custom two-wheelers lays out a flat-price (499!) basic whip and lets you design thousands of color combos via a paint-by-numbers process similar to e-designing a button down, only for people without the kind of button-down jobs that help pay for cars. Offered in two frame sizes, each single-speed whip's constructed from nine distinct components (light steel alloy frame, grooved handgrips, leather seat...) each avail painted in one of eight hues specially formulated by their design team in coordination with the Scandinavian Color Institute, meaning you can have a red rear wheel, a green front one, and a tropical blue chain, which that combination would certainly be off of. Once you've used the dead simple preview interface to design your steez, order up and it'll arrive in a matter weeks, needing only to have the pedals and handlebar attached once it's out of the box (though those thinking outside of it can try riding without them). If you're too lazy to customize something, they've designed a handful of color combos they think're particularly eye-catching, and there's also a "scramble" option that'll auto-generate a random scheme, none of which can be used against your cobras, but at least you can bike the hell outta there.